On this tour we explore the history and culture of Cambodia by bicycle, starting as far back as the 7th Century. 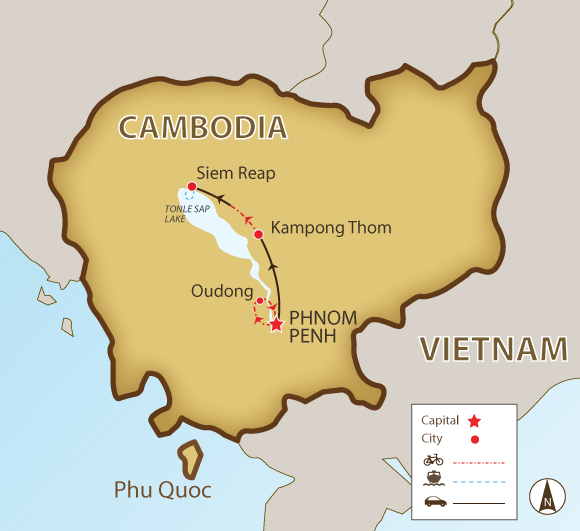 Our ride starts in Phnom Penh, the capital city of Cambodia since the French colonisation of Indochina, once known as the "Pearl of Asia." We ride through the scenery of Cambodia's countryside to Oudong, the former capital of Cambodia from 1618 to 1866. Then to the hills of Phnom Oudong to see a variety of chedis and stupas built in traditional Khmer style. The next day we cycle from temple to temple and visit one of the oldest temple complexes of Cambodia in Sambor Prey Kuk. Then we transfer to Siem Reap and enter the symbol of Cambodia, Angkor Wat. We'll immerse ourselves in the 12th century when the Khmer empire was at its height. At this UNESCO World Heritage Site, we'll explore the high classical Khmer architecture and how it is the best preserved temple complex of both Hinduism and Buddhism. Our journey of discovery will continue beyond the main temple complex to Banteay Srey and to Kbal Spean. Riding our bikes through the countryside, we'll be greeted by friendly locals and get a deeper understanding of their lives. On our last night, we'll enjoy a sunset cruise on Tonle Sap lake. We cycle a total of 238 km mostly on a mixture of tarmac and dirt roads through some very pretty and interesting countryside, taking in a wonderful experience of Cambodia. We meet in the morning for a bicycle tour to enjoy the colonial charm of Cambodia's capital city. We begin along the colourful riverfront to the Royal Palace and continue to the National Museum. We head to Oudong, once capital of Cambodia, observing rural Cambodia life, with a picnic lunch at a local Khmer house. Then we explore the recent dark history of Cambodia in Tuol Sleng Museum of Genocide. We transfer to Kampong Thom where we cycle through the ancient Sambor Prey Kuk. Visit one of the oldest temple sites in Cambodia constructed in the 7th century and have a beautiful ride through rice paddy fields and small villages while locals greet us as we cycle by. We immerse ourselves in the 12th century, when the Khmer’s reign extended far and wide. We cycle to Ta Prohm, famous from the film Tomb Raider, and deliberately left by French conservationists in the same condition as discovered. We cycle through rural countryside to Banteay Srei Temple, with the best-preserved bas-reliefs and stone carvings in Cambodia. After lunch, we trek 3 km uphill through the jungle to a river bed with submersed carvings and a beautiful waterfall. We rise early for sunrise over Angkor Wat and then start riding to the Rolous. The afternoon is free to explore the old market or to just rest by the hotel pool. We meet again late afternoon for a sunset cruise and to see a floating village. We have a short cycle through bucolic Siem Reap countryside to the Silk Farm of Phouk, a fascinating farm/workshop where you can see the entire silk creation process. We return to the hotel by vehicle and say our final good byes after lunch. Day 1 - Phnom Penh Ride 31km. +113m / -114m. We have had an amazing trip. Our tour guide Sok Heng was very very good. He was always on time, helpful, informative and made us feel at home. Our driver was also excellent and always made sure we had enough water. Thank you for an amazing trip, we will book SpiceRoads again and recommend. Our guide was incredible. Knowledgeable, fun and caring. He made our trip truly memorable. We had an amazing experience. It was a such a person and unique way to get to see Cambodia. Our guide was incredibly knowledgeable and all the arrangements were ready in advance for us and made the whole trip easy and stress free! We enjoyed the tour and intend to consider this as a future way to see other parts of South East Asia. We ride 238 km, mostly on a mixture of tarmac roads in reasonable repair and vehicle-width dirt trails. Most of the rides are on flat terrain, through some very pretty and interesting countryside. Outside of Phnom Penh, traffic is light, and we often share the roads with ox carts and other cyclists. The riding is mainly on quiet back roads, and we try to avoid the highways where possible. The trip is fully supported by an air-con minibus that will shadow us for the entire journey. You will be staying in two superb hotels that are well located so you can wander easily out to see more sites or shop. In Phnom Penh, our boutique hotel has a lovely garden and pool, and each room has a unique design and furniture, reflecting local styles. In Siem Reap, our hotel is an oasis with a large pool and garden to relax in after a day of riding. Suitability: This trip has been designed to be an easy trip on flat terrain. This trip can is possible for anyone with a reasonable fitness level. A support vehicle is always available to help when required. Biking Conditions: The daily distances are short with an emphasis on the sites being visited. Roads are a mixture of tarmac, broken tarmac, and vehicle-width dirt roads. Heat and humidity can be a factor, so when possible, riding is done early in the day with afternoons off. We meet in the morning for a bicycle tour of Cambodia's capital city that has managed to retain its colonial charm. Taking advantage of its location at the confluence of the Mekong and the Tonlé Sap rivers, we start along the colourful riverfront to the Royal Palace. Dating back to 1866, it was the last palace built during the French colonial period. We also visit the Silver Pagoda, named for the over 5,000 heavy silver tiles that cover its floors. We move on to the National Museum, built in traditional Khmer style in 1917. After our visit here, we take a ferry across the river where the city has not yet reached. Here, we find modern temples and monasteries, as well as many artisans practicing their traditional crafts such as silk weaving. This is an idyllic place, far from Phnom Penh’s busy streets. We meet up for dinner at Friends Restaurant, where former street youth learn hospitality skills. We head out of the city by taking back roads for about 46 km to Oudong, where we branch off to Phnom Preah Reach or Oudong Mountain. Between 1618 and 1866, Oudong was the capital of Cambodia, built on the top of Phnom Udong. This hill comprises a series of stupas and shrines in a variety of conditions. Unfortunately, almost all the buildings that the Americans did not bomb (as collateral damage from the Vietnam War), the Khmer Rouge destroyed in the 1970s. The 400-plus steps to the top will get the legs working overtime, but the view is worth it! This ride gives us a chance to see rural Cambodia - stilted houses, rice paddies, ox carts, waving children, and, of course, the friendly Khmer people. We have a picnic lunch at a local Khmer house. In the afternoon, we transfer back to the city for a sombre visit to Tuol Sleng Museum of Genocide. We explore Cambodia’s recent dark history in this museum housed in a former school taken over by the Khmer Rouge and used as its main detention and torture centre. We have dinner at the famous Foreign Correspondents’ Club restaurant. We start the day with a 2-hour drive to Kampong Thom, where we cycle through the ancient temple site of Sambor Prey Kuk. We ride between temples constructed in the 7th century to function as the capital of the Chenla Empire. It is one of the oldest temple sites in Cambodia, mostly covered in vegetation. After our guide-assisted tour through the temples, we enjoy a local picnic lunch prepared by the local community in small wooden huts along the Stung Sen River. 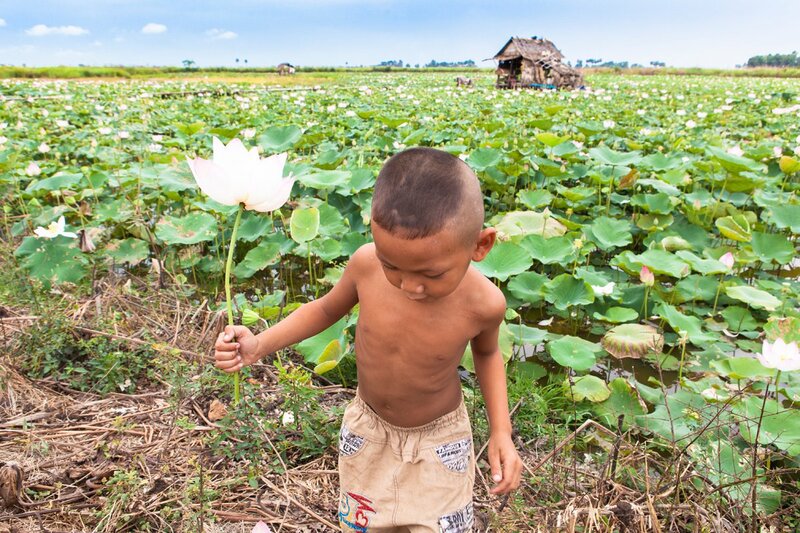 Here we can relax and absorb the sights and sounds of rural Cambodia. After lunch, we have a beautiful ride through rice paddies and small villages with locals greeting us as we cycle by. We then hop back into our van for a 2-hour transfer to Siem Reap, the gateway to Angkor Wat. After we freshened up, we have dinner at a restaurant inside a traditional Khmer house. We immerse ourselves into the 12th century, when the Khmer’s reign extended far and wide. We cycle to the Angkor Wat complex and start our visit of the many temples at Ta Prohm, famous from the film Tomb Raider, and deliberately left by French conservationists in the same condition as discovered: overgrown by strangler fig and silk-cotton trees, giving the temple a mystical and romantic appeal. We continue to Angkor Thom, Bayon Temple, and the Terrace of the Elephants. We break for lunch at the Angkor Café before we explore the biggest religious Hindu edifice in the world - Angkor Wat. Considered the masterpiece of Khmer architecture, this Vishnuite temple is the King’s funerary temple, which is why the temple faces west. Inside the temple, the walls are covered by carvings and bas-reliefs depicting Hindu mythology and the wars Suryavarman II fought during his reign. After our visits to these magnificent temples, we cycle back to Siem Reap. We spend more time in the saddle to visit further flung temples. We cycle through rural countryside to Banteay Srey Temple, with the best-preserved bas-reliefs and stone carvings in Cambodia. The temple is small but of huge significance in understanding the Angkor Era. From here, we continue cycling on rural roads, where we may have a chance to stop at a local village or school and learn about their way of life. If time permits, we'll visit the Landmine Museum, which promotes mine awareness and is run by a former Khmer Rouge child soldier who now works as a de-miner. We take a lunch break before we reach Kbal Spean, also known as the Valley of 1,000 Lingas. We have a moderate 3-km trek uphill through the jungle to a river bed with submersed carvings and a beautiful waterfall (in rainy season only). After our visit, we return to Siem Reap by vehicle. We have a day filled with sunrises and sunsets. We rise early to watch the sun rise over Angkor Wat and then start riding to the Rolous. Rolous was the first town created by the kings of Cambodia. The first edifice built was the temple of Preah Ko, composed of six brick towers still partly covered by stucco and dedicated to Jayavarman II. The second temple of the Rolous is Bakong Temple, built in 881 AD, the state temple and the largest of the city. The temple is the representation of Mount Meru, home of the gods. We head back to our hotel, and the late morning and afternoon are free to explore the old market or to just rest by the pool. We meet again late afternoon to transfer to Tonle Sap for a sunset cruise and to see a floating village. (If water levels are low, we'll go to Phnom Krom to watch sunset). Transfer back to town for our farewell dinner. After breakfast, we go for a short cycle through picturesque, bucolic scenery of rice paddies with wallowing water buffalo, countryside pagodas, and villages comprised of traditional stilted houses. We ride to the Silk Farm of Phouk, a fascinating farm/workshop where you can see the entire silk creation process, including mulberry bushes grown to feed the silk worms and worm breeding. We return to the hotel by vehicle and say our final good byes.